The Bureau of Criminal Investigation (BCI) Science School is now available to teachers and students across Ohio. The free lesson plans are designed for fourth graders and will expose students to several careers including forensic science, criminal investigation. 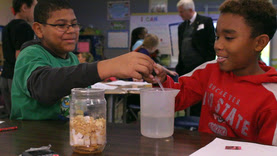 The Ohio Attorney General’s Office explained in a press release that students will conduct hands-on, inquiry-based experiments in class and solve relevant challenges using critical thinking and problem-solving skills. The courses include videos that “take” students into the field with BCI agents and into the laboratory with forensic scientists. The Attorney General took a trip to visit fourth grade students at Herbert Mills STEM Elementary School in Reynoldsburg (Franklin County, Ohio). The students worked on extension projects, after finishing the BCI Science School curriculum. A farmer named Bob Agriculture is missing, along with his dog, Buckeye. Bob’s wife calls police when she can’t find the two and notices their barn has been broken into, chemicals are missing, and there’s a threatening note on the barn window. Students help figure out what happened to Bob Agriculture and who might be responsible. They determine if any crimes were committed. Teachers with questions about implementing BCI Science School in their classrooms can contact BCI@OhioAttorneyGenera l.gov.